LAKEVIEW — A six-bedroom, custom-built home with seven total bathrooms at 3817 N. Wayne Ave. is listed for $2,225,000. Chris Paloian Fixler with @properties said the sunny main level features a spacious living room with a fireplace and an elegant dining room. The beautifully updated white, eat-in chef's kitchen has a large butler's pantry, state-of-the-art appliances, custom cabinets and large island with a breakfast bar. The kitchen leads into the family room with another fireplace and a coffered ceiling. The second level has a spacious master suite with double walk-in closets and a master bath with a soaking tub, separate steam shower, double vanities and heated floors. The level also has two more en-suite bedrooms and a laundry closet. The third level has another bedroom and a bonus rec room with a wet bar that includes an ice machine, beverage fridge and dishwasher. Sliding doors lead to a large roof deck with great views of the city, Paloian Fixler said. The lower level has two more bedrooms, a custom wet bar, a rec room, laundry room, radiant heat floors and a mud room that leads outdoors, where you'll find a professionally landscaped yard, a two-car garage and sidewalk/front steps with radiant heat technology. 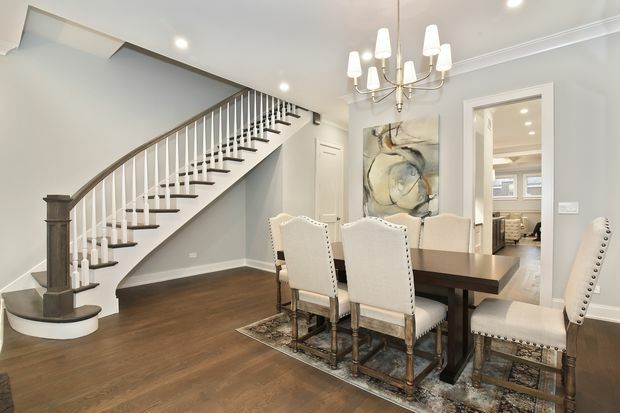 The stately brick home is close enough to walk to Cubs games, but far enough away from the commotion of Clark Street on a quiet street in the Southport Corridor, Paloian Fixler said. This article showcases a home of interest to our readers and represented by an advertising partner.